STOCKTON - The season-ending event Sunday at Stockton 99 Speedway featured three of the four track champions racing for one last time in 2012 at the annual Fall Classic. An estimated 1,000 fans saw Tracy's Scott Winters compete after claiming the state championship in the Division I Premier Grand American Modifieds division, winning track titles at both Stockton 99 and Roseville's All-American Speedway. Track officials said Winters's feat is unprecedented. "In the offseason we thought it was a big goal, but then it became a realistic goal," Winters said before Sunday's race. "We knew we were in the running at both tracks, but our one big hurdle was that the tracks sometimes raced on the same night. Twice we had to go to the track where we needed the most points, and we had to give up points at the other." Winters credited his team's success to the dedication and perseverance of everyone, from owner Wayne Ferrari to crew members Don Kramer, Tim Carr and Chris Allen. Crew chief Ron Ostorero said he saw good things ahead when he teamed up with Winters in 1999. "Scott's the total package," Ostorero said. "He doesn't make mistakes, and he doesn't wreck the car. We can work on getting faster instead of constantly repairing the car." The formula has worked to the tune of 16 main-event wins in 2012, with his 100th career GAM victory coming late in the summer. Since 1997, he has eight track championships: four at All-American Speedway and two each at Madera and Stockton 99. "From a team perspective, it's the hardest thing to do," Winters said. "The crew shows a lot of passion for the sport. They're tireless. We're here today because we're passionate about racing." In the 60-lap GAM finale, Winters finished third after a collision on the 11th lap with race leader Mike Regleman sent him to the back of the pack. After eight yellows, Jay Lindstroth emerged as the winner. Pure Stocks champion Tyler Guzman of Ceres and Super Stocks champion Jason Aguirre of Atwater returned Sunday, while Western Late Model champ Jeff Belletto of Modesto did not. In Pure Stocks, Stockton's Guido Bindi won the 50-lap race after starting on the outside pole. He was chased by Robert Dueck and Bobby Simpson Sr., both of Stockton, who were in contention until their collision during the 49th lap left them out of the top seven. Guzman finished seventh. 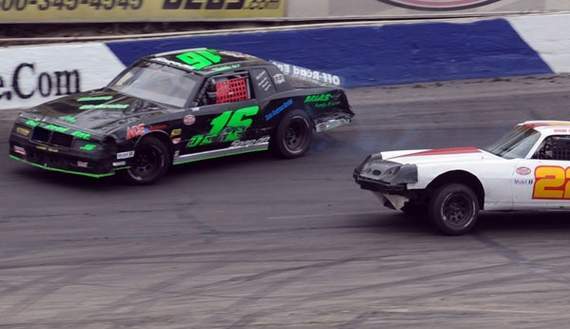 The 17-car, 55-lap Super Stocks race was packed with drama and crashes as race leader Chad Holman of Manteca was knocked out on the 30th lap by Aguirre. Riverbank's Aaron Coonfield, who started the race in 14th, led by a restart on the 34th lap 34 and held on for the victory. In the 100-lap Western Late Model race, Lodi's Michael Wendt started on the outside pole and led for the majority of the race before being overtaken on the 74th lap by Travis Milburn of Eagle, Idaho. Wendt had second place in hand before making contact with Sacramento's Jason Philpot on the 96th lap. Manteca's Ross Strmiska moved into second place on the restart and Luis Tyrell finished third.